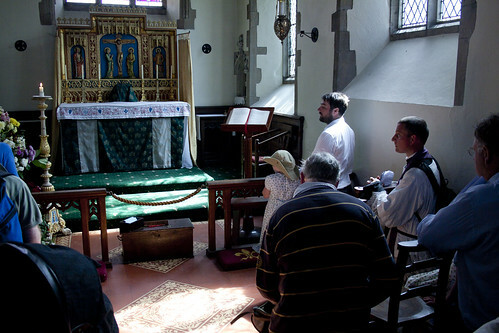 See also a post on the liturgy, and a running commentary. Now my feet are slowly recovering, and I've had a chance to process my photos, it is possible to take stock of this pilgrimage, which was the first of its kind; I'll do a separate post on the liturgy along the way. We were extremeley fortunate from the very beginning of the planning, to have several important precedents to follow: several of the walkers, including me, had been on the Chartres Pilgrimage; one of our support team, Jeff Pillar, had an intimate knowledge of the great Walsingham Pilgrimages of the Guild of Our Lady of Ransom, and more recently those of the Dominican Sisters of Ely. Our chief organiser, Paul Smeaton, had been on the traditional 'Christus Rex' Pilgrimage from Ballerat to Bendigo in Australia. From all of these pilgrimages we learnt important lessons, both practical and in relation to the spirit of the thing. For example, we adopted some of the practices of the Australian pilgrimage, adapting their pilgrim's handbook and using the impressive pilgrims' blessing at the beginning, and we sang the Rosary in Latin as it is done at Chartres. Our route and stopping places were based on the Dominican Sisters' pilgrimage. We are very grateful to the people who have been welcoming them for welcoming us also, especially the Convent of the Sacred Heart in Swaffam, in whose school gym most of the pilgrims slept, and the Bedingfeld family, who allowed us to have Sung Mass in their lovely private chapel. We were given a great welcome by the Parish Priests in both Ely and Downham Market, who let us sleep on their floors and use their churchs. 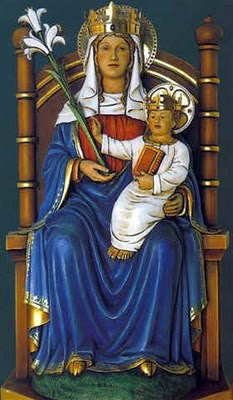 We are also grateful to the Shrine of Walsingham itself, for finding us a slot for Mass at reletively short notice. 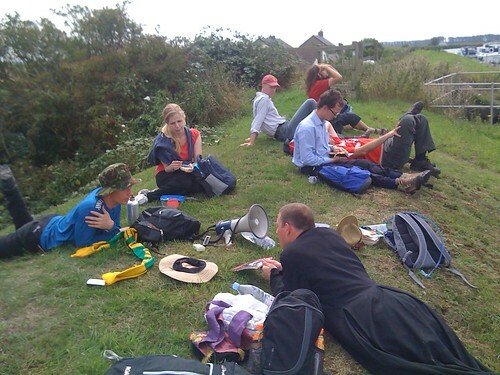 One of the lessons of the pilgrimage, in fact, is how welcoming and helpful so many people on the route are to pilgrims, of whom of course there is a steady stream. 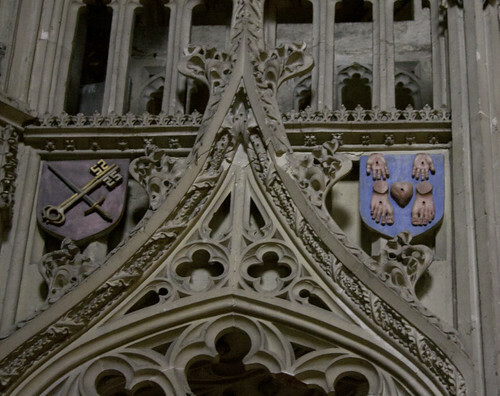 Catholic symbols in Ely Cathedral: the keys and sword of the Papacy, and the Five Wounds, which served as the banner of the Pilgrimage of Grace, the great protest against the Dissolution of the Monasteries, and was carved on the wall of the Salt Tower in the Tower of London by Catholics awaiting maryrdom. How did it work? Contrary to what we had imagined, we managed to avoid using tents: there was enough space in the presbyteries and the school already mentioned for everyone. This made things a lot simpler, and cut down the gear which needed to be transported. As on the Chartres Pilgrimage, we had support vehicles taking the heavy baggage and providing us with water at regular intervals. 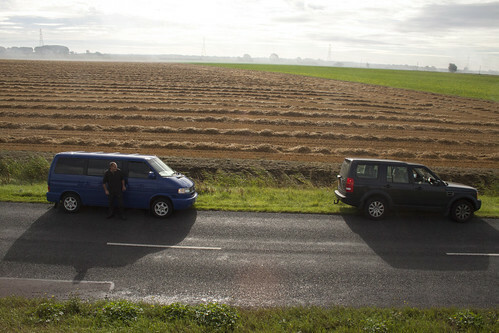 These consisted of an 8-seater car, a Landrover, and a minbus. The nuns at Swaffam allowed us to use their large minibus on the Sunday as well. Two of our support vehicles. The route was meticulously planned; two chaps actually walked the great majority of it a couple of weeks earlier, to check the details and work out realistic walking times. The one section on footpaths which they weren't able to walk in advance was the one place where - perhaps inevitably! - we got slightly lost. This merely meant a lot of earnest looking at maps and a slight detour. The stops were planned, so we could be met by the support vehicles, but we didn't walk exclusively on roads. 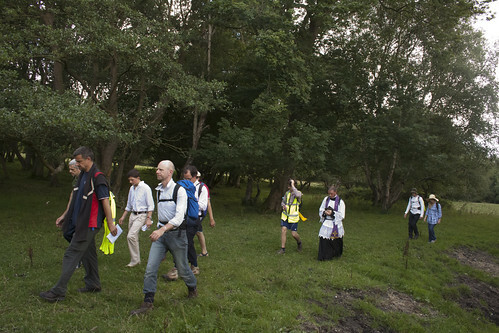 On the first day, we were almost entirely walking on the high banks of the Great Ouse and the Little Ouse, and we made a lot of use of footpaths on the second day as well, walking through some lovely woods after our stop at Oxburgh Hall. When on roads without footpaths our small group - between 10 and 12, as we were joined by extra people - had a lookout with high-visibility clothing at the front and back, with walky-talkies, to warn us about approaching cars. In fact the traffic was very light on these roads. At the Mass for Chartres pilgrims in Westminster Cathedral, Fr Martin Edwards, the principal chaplain, joked that if English people were organising it would involve a lot of detours to agreeable pubs. 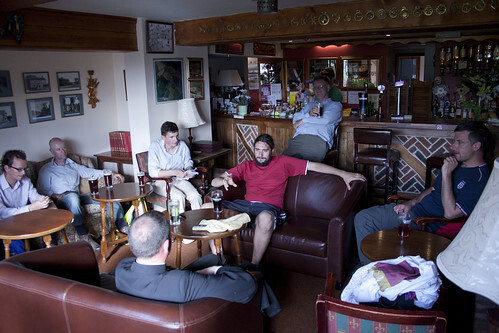 Many of our stopping places were, in fact, pubs, but they were invariably closed when we got there: they use old-fashioned opening hours in East Anglia. There was one place, the Great Danes, near Swaffam, where the landlord found us resting on his outside benches and very cheerfully offered to serve us; this was very nice, but an exception! As for the walk itself, it was certainly hard work. We had glorious weather, despite the despondant weather forcasts - all the rain fell at night. We made much better progress than we had anticipated on the first day, and kept up the pace well throughout. We did, of course, get the usual blisters and aches and pains. I have yet to find the ideal walking shoes; although my blisters were not as bad as at Chartres they certainly didn't let me forget about my feet! We walked 20 miles on each of the first two days, which was about 7 hours walking; starting at 7.30 from Ely, we got into Downham just before 5pm, and had Mass in the evening, followed by fish and chips. On the second day we left again at 7.30, and after an extended stay at Oxburgh, including Mass, and getting slightly lost, we got into Swaffam at about 8.30. 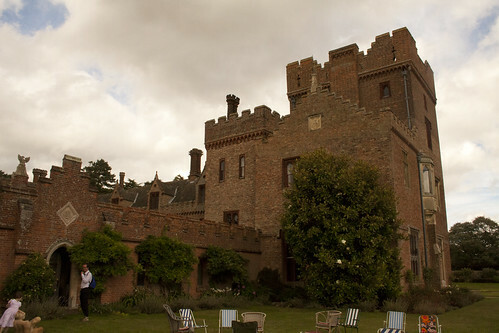 The private garden, within the moat, at Oxburgh, where the Bedingfelds invited us to have our lunch. 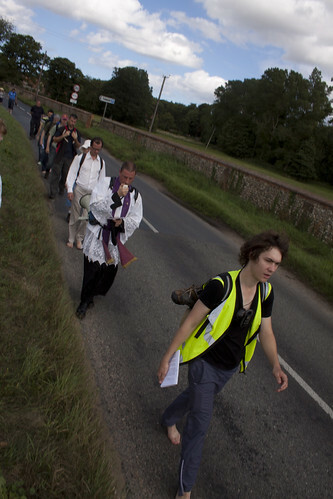 It was annoying not to be able to cover all the distance to Walsingham on foot, but with Mass at 2.30pm on Sunday it was obviously impossible to cover another 20 miles that day. We did half the distance, about 10 miles, being dropped off by minibus just south of the village of Helhoughton, south of Fakenham. 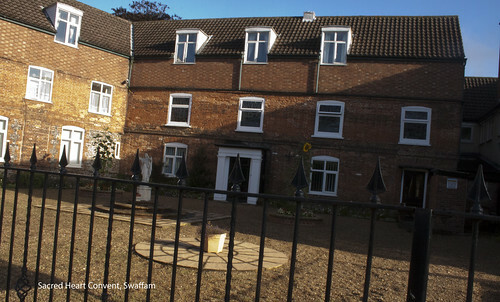 We then walked to the village of Walsingham, and walked back the 'Holy Mile' to the Catholic Shrine. Despite the fatigue and blisters, many of the pilgrims took their shoes and socks off for the Holy Mile, in accordance with ancient tradition: this tradition, of course, is the origin of the 'Slipper Chapel', the place for pilgrims' shoes, at the southern end of the Holy Mile, which is the only part of the ancient shrine complex which has survived intact, and is in Catholic hands as the heart of the Catholic Shrine. 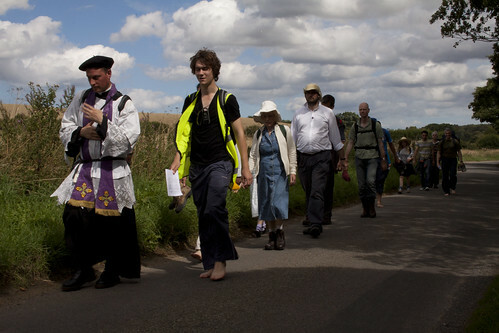 Pilgrims on the Holy Mile, led by our Chaplain Fr Alexander Redman. The pilgrimage was a wonderful event. No one dropped out from injury or fatigue. As well as the prayers and the many hymns and songs we chatted at intervals and were able to have periods of quiet reflection. The group didn't come from any one place or group of friends, and included people of a wide range of ages and backgrounds, yet it was jolly and cohesive. 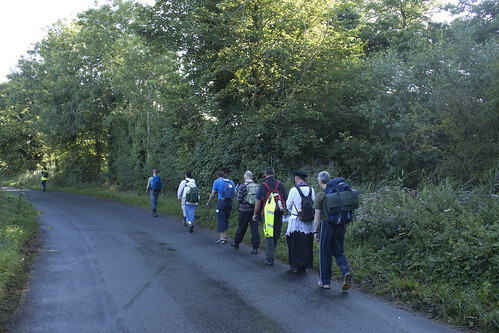 This was a walking pilgrimage with a serious edge: fifty miles in three days is no joke. But it not as demanding as the Chartres Pilgrimage, and not the kind of thing where only the fittest can make it all the way to the end. A pilgrimage like this, with serious physical effort and the inevitability of some degree of suffering, is a worthy offering to Our Lady of Walsinham for even the great intention which we had as a group, the Conversion of England, and our individual intentions. I hope to join this pilgrimage for many years ahead, and see it grow. We have made a good start. See here for a slideshow of the photographs.